Who Is Blues (est. 2017) features the work of author Vincent Abbate and is intended as a rough guide to the most unique, gifted and hardest-working artists in contemporary blues. In-depth WIB interviews, live reviews and our weekly WIB of the Week feature explore the cutting edge of today’s blues scene. Now available: WHO IS BLUES Vol. 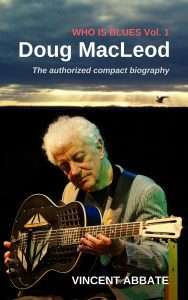 1: Doug MacLeod, the first in a series of authorized compact print biografies.